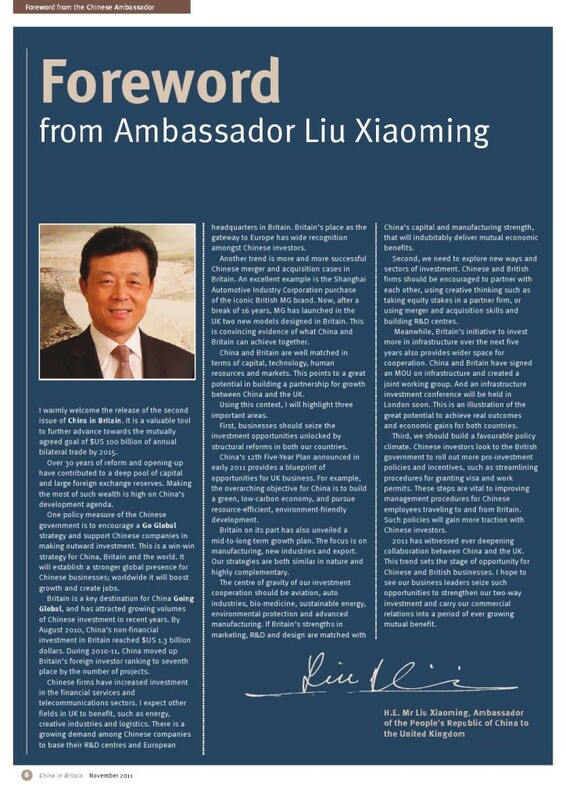 I warmly welcome the release of the second issue of China in Britain. It is a valuable tool to further advance towards the mutually agreed goal of $US 100 billion of annual bilateral trade by 2015. Over 30 years of reform and opening-up have contributed to a deep pool of capital and large foreign exchange reserves. Making the most of such wealth is high on China’s development agenda. One policy measure of the Chinese government is to encourage a Go Global strategy and support Chinese companies in making outward investment. This is a win-win strategy for China, Britain and the world. It will establish a stronger global presence for Chinese businesses; worldwide it will boost growth and create jobs. Britain is a key destination for China Going Global, and has attracted growing volumes of Chinese investment in recent years. By August 2010, China’s non-financial investment in Britain reached $US 1.3 billion dollars. During 2010-11, China moved up Britain’s foreign investor ranking to seventh place by the number of projects. Chinese firms have increased investment in the financial services and telecommunications sectors. I expect other fields in UK to benefit, such as energy, creative industries and logistics. There is a growing demand among Chinese companies to base their R&D centres and European headquarters in Britain. Britain’s place as the gateway to Europe has wide recognition amongst Chinese investors. Another trend is more and more successful Chinese merger and acquisition cases in Britain. An excellent example is the Shanghai Automotive Industry Corporation purchase of the iconic British MG brand. Now, after a break of 16 years, MG has launched in the UK two new models designed in Britain. This is convincing evidence of what China and Britain can achieve together. China and Britain are well matched in terms of capital, technology, human resources and markets. This points to a great potential in building a partnership for growth between China and the UK. Using this context, I will highlight three important areas. First, businesses should seize the investment opportunities unlocked by structural reforms in both our countries. China’s 12th Five-Year Plan announced in early 2011 provides a blueprint of opportunities for UK business. For example, the overarching objective for China is to build a green, low-carbon economy, and pursue resource-efficient, environment-friendly development. Britain on its part has also unveiled a mid-to-long-term growth plan. The focus is on manufacturing, new industries and export. Our strategies are both similar in nature and highly complementary. The centre of gravity of our investment cooperation should be aviation, auto industries, bio-medicine, sustainable energy, environmental protection and advanced manufacturing. If Britain’s strengths in marketing, R&D and design are matched with China’s capital and manufacturing strength, that will indubitably deliver mutual economic benefits. Second, we need to explore new ways and sectors of investment. Chinese and British firms should be encouraged to partner with each other, using creative thinking such as taking equity stakes in a partner firm, or using merger and acquisition skills and building R&D centres. Meanwhile, Britain’s initiative to invest more in infrastructure over the next five years also provides wider space for cooperation. China and Britain have signed an MOU on infrastructure and created a joint working group. And an infrastructure investment conference will be held in London soon. This is an illustration of the great potential to achieve real outcomes and economic gains for both countries. Third, we should build a favourable policy climate. Chinese investors look to the British government to roll out more pro-investment policies and incentives, such as streamlining procedures for granting visa and work permits. These steps are vital to improving management procedures for Chinese employees traveling to and from Britain. Such policies will gain more traction with Chinese investors. 2011 has witnessed ever deepening collaboration between China and the UK. This trend sets the stage of opportunity for Chinese and British businesses. I hope to see our business leaders seize such opportunities to strengthen our two-way investment and carry our commercial relations into a period of ever growing mutual benefit.